Michael McLaughlin is a professor at Brigham Young University-Idaho in the Computer Information Technology Department of the Business and Communication School. 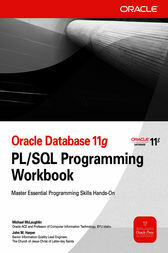 He is the author of Oracle Database 11g PL/SQL Programming and other titles. John M. Harper is a database professional with 10 years of Oracle experience. He is currently a senior lead engineer at the Church of Jesus Christ of Latter-day Saints.